Microsoft unveiled Windows 10 version 1809, the October 2018 Update for Windows 10 on October 2, 2018, officially. The company published updated tools to upgrade to a new version of Windows 10 and enabled the update on Windows Update as well but only for users and administrators who clicked on the "check for updates" button manually in the Windows Update interface. Reports started to emerge soon thereafter that, once again, updates were not processing as smoothly as possible for some users. User reports suggested that personal files were deleted on some machines and that there were a number of issues next to that. Microsoft itself blocked updates for devices with certain hardware or software configurations outright as these configurations were known to have issues with the new version of Windows 10. 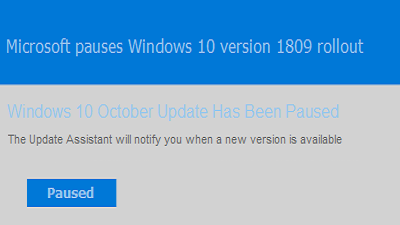 The company posted an update on the official Windows 10 version 1809 support page on the Microsoft website on October 5, 2018. There it revealed that it decided to pause the rollout of the update because of data loss reports by users who performed the upgrade on PCs. Microsoft urges customers to wait with the installation of the Windows 10 feature update; users who downloaded the ISO files manually or created installation media are urged not to install it until new media is available. Further explanation is posted on Our Forum.